Last week, the Congressional Budget Office released it’s latest snapshot on the Federal budget. CBO estimates that the federal budget deficit was $984 billion — just short of a trillion dollars — during the first eight months of the fiscal year (October 2008 through May 2009). 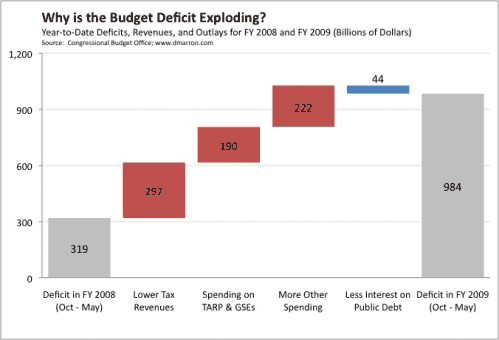 During the same period last year, the deficit was “only” $319 billion. » Lower tax revenues. Revenues have fallen almost 18% since last year, adding $297 billion to the deficit. Income tax revenues have been particularly hard hit: individual income tax payments are down more than 20%, and corporate income taxes are down more than 60%. » New spending on TARP and the GSEs. CBO estimates that taxpayers will lose $130 billion on the TARP investments made to date. In addition, the government has paid $60 billion to Fannie Mae and Freddie Mac, the two housing GSEs. Together, these parts of the financial rescue have added $190 billion to the deficit. » More spending on other programs. Spending on other programs has increased more than 12% over the same period, adding $222 billion to the deficit. CBO notes that spending rose particularly sharply for Medicaid (up 21%) and unemployment insurance (up 140%). Those increases reflect recent legislation that expanded Federal spending on both programs, as well as increased enrollment in the programs due to the weak economy. » Lower (!) interest payments on the public debt. The public debt has, of course, been growing rapidly in order to finance rising deficits and the financial rescue. But interest payments have actually fallen, thanks to low short-term interest rates and smaller costs for inflation-indexed bonds. As a result, interest payments have been $44 billion lower this year.